That this prosperity comes from both the agricultural and industrial sectors is equally obvious. From a conversation with S S Hiremath, chairman of the local co-operative spinning mill, who when asked to account for the prosperity cites the systematisation of agriculture, or advocate Karkode, practising at the local sessions court, who lists the large number of industries in and around the place. "What we have here is a very systematic development," says Hiremat. "With water from the Ujini Dam and electricity from Koyna, every individual farm has increased its production capability. Sugar is, of course, our staple, but there are vineyards, and a wine-processing plant, (the local brands Bosca and Cinzano are manufactured here), there is the milk products industry, every day the cooperative collects milk from the farmers, about Rs 7 million worth, every farmer has his stock of cows as well; this feeds the agro-processing plants, industry, then there is the poultry farm…." "We have two MIDCs, then there are the big industries, Crompton Greaves, Kalyan Steel, Greaves Cotton, Baramati Textiles…." lists Karkode. "What this means is that for one thing, the young boys get lots of employment opportunities right here, they don't need to go elsewhere to work. And for another thing, when you have so many industrial units, with their quota of workers, then the town benefits, because people come in to buy things from the shops here…"
When I ask Sharad Pawar about it, he says it comes from what he calls micro-planning. "Baramati is not on any main highway, so actually, it should have been backward, but we have worked on it systematically -- the key to our development plan was to ensure that the purchasing power of the poorest farmer improved, when that happens, everything else follows," he explains. But is this prosperity for real, is it down deep, or merely surface flash? Hard though it seems to find, in Baramati, someone who will say a negative word, I find one such in Deshpande, another lawyer and, by his own admission, a Bal Thackeray freak. "See," he argues, "Baramati taluka's real wealth is its farms. But what is happening here, because of this industrialisation, is that in the first place, the farmers are tempted to sell off their lands to industry, tempted by the chance to make a quick packet. Then, the local youths don't really get good jobs here, such jobs go to outsiders while our local boys work as casual labour on contract, 22 days a month, earning just about 1,000 rupees. This is obviously insufficient to improve their standard of living, but the youth is like that, they prefer 'factory job' to farming, because of this they don't work on the farms and that is a double blow to our economy, actually…"
Opposite the Baramati town hall, in an open ground, I find a group of young men playing cricket -- and quite well too, none of the slogging, across the bat heaves that tend to characterise the rural player. I sit and watch a nifty left arm quick bowler for a while and, when they take a break, wander across for a chat. The boys agree that their peers -- this lot is comprised of collegians -- are getting only casual labour. But they are quick to argue that this is neither unexpected, nor an indication that industrialisation has been bad for the area. "The boys here don't have the technical qualifictions, so how can you expect the companies to hire them in the better posts?" asks Sudit, the left-arm quick. "But you should also remember that a lot of us are now studying in the technical colleges and courses here, so when we are qualified, then we stand a better chance of getting the high-paying jobs…"
Both arguments make sense. And both crop up repeatedly, in conversation with the locals. You realise it is not one of those things that you can weigh, label, and at some point, say Aye or Nay… how it strikes you is that Baramati seems to be in a state of flux, its older generation sticking with the traditional agrarian means of earning a livelihood while the young are more eager to slough off the sweat of farming, and go with the industralisation flow. Is that good or bad? Economists and such might be able to cite chapter and verse and nail down an answer -- I find myself stumped. At Sopa village, the farmer offers me a tender sugarcane stalk and when I ask for a knife to remove the thick outer skin, he tells me that a sugar cane should be enjoyed with my own teeth… this business of cutting it into small cubes and chewing, he tells me, takes the fun out of it. Wherever you go in Baramati and its surrounding areas, the sugarcane motif is hard to miss. Whether it is in the cane-juice bars that replace the tea shops as the preferred hangout, or in the way every single conversation here turns to sugar, and elections to sugar co-operative elections, and such. In fact, it is rather weird -- here, political conversations are not about the BJP and the Congress and who will form the government, it is about what happened in the last sugar coop election, why it happened, and so on. Even the rival camps confine their analysis and argument to sugar elections. Thus, Shivraj Kakde, brother of BJP candidate Viraj and a former Pawar groupie, gleefully points out how the Pawar camp, headed by nephew Ajit Pawar, were humbled when their Neelkanteshwar panel was defeated in the Malegaon Sugar Factory Board elections. "We won 21 seats out of 24, and the Malegaon factory was actually founded by Pawar's father, Govindrao, the family has controlled it for thirty years now, what more proof do you want that his hold is not as strong as he would like people to think?" Pawar's brother Appasaheb -- he is the one who is permanently Baramati-based, and overseas his brother's campaign -- counters by pointing out that Ajit Pawar avenged himself by defeating the Kakades in the subsequent election to the Someshwar Co-operative Society. "Viraj Kakde's father and uncles are all on the board of directors there, and they lost badly," gloats Appasaheb. The Sena-BJP government, in a bid to break the stranglehold the sugar barons, traditionally Congress supporters, have on the farming vote bank, introduced -- with some prompting from Shetkari Sanghatana chief Sharad Joshi -- the new dezoning law. Earlier, thus, farmers who formed part of the co-operative were expected to sell their cane to the factory specified for them. What dezoning does is permit the farmer to sell to any factory he fancies, thus breaking the stranglehold the factory owner has on the farmer. However, says Hiremat, the policy was conceived in haste and its negative fallout is already affecting the farming community hard. "What it has introduced is unhealthy price-cutting. "After the dezoning law came into operation, 25 mills have closed, 80 more are sick. Why, you ask the deputy chief minister, (Gopinath) Munde what happened to his own factory in Ambejogai (in the Marathwada area), he is struggling to pay the wages, it comes of trying to buy cane at unrealistically cheap prices." As with everything else in Baramati, opinion seems sharply polarised. But funnily enough, the undercurrent I sense is that the sugar lobby -- of which, I am told by someone, Hiremat is a major player -- is about ready to swing back to the Congress, the party it has traditionally favoured. That opinion is repeated, with varying degrees of emphasis, across the constituency. And when I point out that three of six assembly constituencies here -- minister Harshvardhan Patil, in Indapur, the Sena's Gajanan Babar in Haveli, and the Janata Dal's Dada Jadhavrao, who is supporting Kakde, in Purandhar -- are in the opposition camp, there is much scoffing. The last result, Appasaheb Pawar and his entourage hold, was an aberration, caused by dissidence and by Pawar's deliberate indifference. "Babar, despite our votes being split, won by less than a thousand votes. Patil is an Independent, he sympathises with us. As for Jadhavrao, he again benefitted from our votes being split," comes the argument. In a constituency of 1.2 million voters and a bit, spread across nearly 700 villages, the pro-Pawar feeling is palpable. Remains to find out why. One reason is schools -- Baramati is flush with them. There is the Vidya Pratishtan, which provides education, from pre-primary right up to post graduation. There is Sharda Nagar -- an exclusive girls school meant for the village girls (though the staff admit that in the higher classes, there are many students from other parts of the state), which boasts seven hostels, no less, catering to 1,000 inmates, each equipped with such luxuries as saunas, gymnasiums and, collectively, a mini theatre for the entire campus. There are, further, institutes for pretty much every branch of study you could want -- barring medicine and law, for both of which, says Sharad Pawar, central sanction was only recently obtained. Another is the industrialisation of the area. "If it were not for Pawarsahib, would you have even heard of Baramati? But today, it is second only to Pune in terms of development," boasts Reddy. It all boils down to a perception that Pawar has really worked for his constituency, helped put it on the India map. "All our prime ministers have come here," is a common refrain in the town. At 3 PM on the 26th, with just two hours to go for campaigning to end, a party orator is keeping a crowd at the Mission Bungalow Ground in good humour. 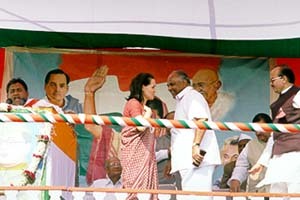 On the dais are the likes of Ajit Pawar, and city party chief Ajit Gajar. The sally, part of a fierce attack on Atal Bihari Vajpayee, is greeted with a roar of appreciation. Like I said, all I see are a sea of heads. A lot of them sport the traditional Congress cap, which I notice is pretty common headgear in Baramati anyway (though the young ones have now taken to faux Reebok and Nike skull caps). I don't know how many people there are, but there is sure one heck of a lot. And as first the fire engine, then the ambulance, then the pilot cars filled with gun-toting security and, behind them, Pawar's dark blue Pajero drives up, there is sheer, unadulterated bedlam. The speech is, like his two earlier ones in the day, very tame by his aggressive standards. But it doesn't seem to matter -- applause interrupts almost every other sentence, whether it is a dig or three at Vajpayee -- "They keep saying ab ki baari, ab ki baari, this is the third time I am hearing this, Vajpayee is like a groom at the mandap, waiting for a bride who has run away with someone else" -- or a firm promise that the Congress is going to form the next government. It doesn't seem to matter what he says, or how he says it. Sharad Pawar is home. And Baramati, where he traditionally makes his last campaign speech before winding up for the duration, is in a mood to celebrate.